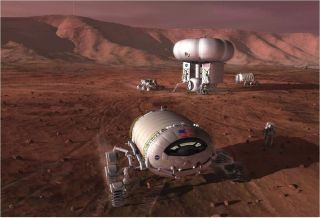 An artist's illustration of astronaut pioneers on Mars. Building a self-sustaining settlement on the Red Planet will require taking advantage of native Martian resources, exploration advocates stress. NASA is challenging people throughout the United States to come up with a new and efficient way to convert carbon dioxide into glucose, a simple sugar. CO2 dominates the thin atmosphere of Mars, and energy-rich glucose is a great fuel for microbe-milking "bioreactors" that could manufacture a variety of items for future settlers of the Red Planet, NASA officials said. "If we can transform an existing and plentiful resource like carbon dioxide into a variety of useful products, the space — and terrestrial — applications are endless," Roman said in a NASA statement. The new competition consists of two phases. During Phase 1, applicants submit a detailed description of their CO2-to-glucose conversion system. Interested parties must register by Jan. 24, 2019 and submit their proposals by Feb. 28, 2019. In April, NASA will announce the selection of up to five finalists from this initial crop, each of whom will receive $50,000. Phase 2 will involve the construction and demonstration of a conversion system. Winning this round is worth $750,000, bringing the competition's total purse to $1 million (assuming five finalists are indeed selected from Phase 1). You don't have to win, or even participate in, Phase 1 to compete in Phase 2. The challenge is open to citizens and permanent residents of the United States; foreign nationals can compete if they're part of a U.S.-based team. To register or learn more, go to the CO2 Conversion Challenge website. The Centennial Challenges program, which is run by NASA's Space Technology Mission Directorate, aims to encourage the development of exploration tech by engaging talented and innovative people beyond the traditional aerospace community .